Ultraviolet light is electromagnetic radiation with a wavelength shorter than that of visible light. The spectrum consists of electromagnetic waves with frequencies higher than those that humans identify as the color violet (purple). UV light is typically found as part of the radiation received by the Earth from the Sun. Most humans are aware of the effects of UV through the painful condition of sunburn. Ultraviolet germicidal irradiation has been studied since the 1930’s and has been used to destroy the microbes that cause indoor air and water pollution. For many years, the medical industry has used UV light to sanitize rooms and equipment. The Centers for Disease Control recommend UV lamps for their germicidal effect. UV can be separated into various ranges, with short range UV (UV-C) considered "germicidal UV." At certain wavelengths UV is mutagenic to bacteria, viruses and other micro-organisms. Ultraviolet light is part of the light spectrum, with UV-C from 100 nanometers (nm) - 280 nm; UV-B from 280 nm - 315 nm; and UV-A from 315 nm - 400 nm. Optimum UV germicidal action occurs around 260 nm. UV-C light deactivates the DNA of bacteria, viruses and other pathogens, which destroys their ability to multiply and cause disease. As UV light penetrates through the cell wall and cytoplasmic membrane, it causes a molecular rearrangement of the microorganism's DNA, which prevents it from reproducing. Specifically, UV-C light causes damage to the nucleic acid of microorganisms by forming covalent bonds between certain adjacent bases in the DNA. The formation of such bonds prevent the DNA from being unzipped for replication, and the organism is unable to reproduce. In fact, when the organism tries to replicate, it dies. What are the Advantages of UV Disinfection? Since natural germicidal UV from the sun is screened out by the earth's atmosphere, we must look to alternative means of producing UV light. This is accomplished through the conversion of electrical energy in a low pressure mercury vapor "hard glass" quartz lamp. 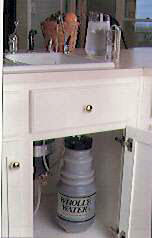 Electrons flow through the ionized mercury vapor between the electrodes of the lamp, which then creates UV light. 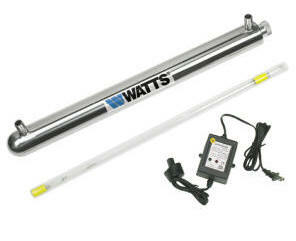 Put Ultraviolet light to work for you with your own UV light water treatment system. 99.99% germicidal disinfection against bacteria and viruses! 304ss chamber, electronic ballast with audible and visual alarm, lamps rated for 30 mj/cm2 @ end of lamp life (9,000 hrs), single lamp per vessel, 3/4 in. MNPT, 110v or 220v. NOTE: we no longer stock this item. Contact www.watts.com for info.